A comprehensive survey of Poltergeist cases by Alan Gauld & Tony Cornell - Gef! Parapsychologists Alan Gauld and Tony Cornell undertook a scientific study of 460 poltergeist cases from around the world, and they published the results in their 1979 book Poltergeists. They found that in 61% of cases, the poltergeist phenomena were associated with a house, with 58% occurring at night. Where a person was identified as being the focus or ‘agent’ for the phenomena, they were female in 29% of the total number of cases, and 11% male. These ‘agents’ were more likely to be under 20 years old (30%) than over (8%). So here is partial, if not conclusive, confirmation for the notion of teenage girls being the focus for poltergeist episodes. Incidentally, the discrepancy between these (and other) figures which do not add up to 100% may be accounted for by the fact that some of the data they used was incomplete or unclear. 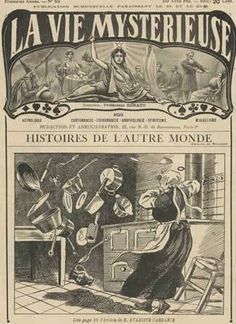 Cornell and Gauld took their information from accounts contemporary with the events themselves – typically newspaper and journal reports – some of which dated back to the pre-1800s. Of the specific phenomena tabulated in Cornell and Gauld’s list of data, we find only some which feature in the Gef case. Thus, the most common characteristic they found was “communication through phenomena,” a feature of 79% of their entire 460 cases, implying sentience on behalf of an entity (if entity there is, rather than an exteriorized aspect of the human mind). Certainly we can see that Gef’s behaviour (not just his speech, but the knocking and banging, and catching chickens) would fall into the category of communication. However, the next most highly-ranked characteristic listed is “assault – pinches, blows, scratches, etc.” does not appear relevant. At a stretch, one might include the instances of small stones thrown at the Irvings, and of biting Margaret’s finger, but these do not seem to be of the same order as the alarming physical assaults leading to wounds and other injuries which have been reported, and in some cases photographed, (for example, Eleonora Zugun) in poltergeist cases. Perhaps the absence of such hostile and malevolent assaults is indicative of Gef’s unusually amicable relations with his ‘hosts’ – it is very unusual for there to be such friendship between a ‘spirit’ (whether poltergeist or other) and the humans with whom it shares the space. Next on the list, we have bedclothes or pillows being disturbed – 66%. This did not occur at Doarlish Cashen. Similarly, the next most common two features – “incendiary effects” (53%) and “luminous effects” (49%) – are inapplicable. The prevalence of small fires in poltergeist cases is well-known, but the Irvings never reported anything of the kind. Another common feature of poltergeist episodes is that of small objects being moved (64%). The only instance for this in the Gef case might be at the very beginning, when James Irving inspected the loft and found a wooden ‘Indian’ figurine up there – he recognized it as his own but claimed to have no idea how it had got there. ‘Apports’ (as unfamiliar objects materialising in the house, as opposed to known objects already in the house being moved) are less common at 22% – here we might consider as relevant the small objects – paintbrushes, a collar-stud, a glove – which Gef would bring back to the farmhouse. He told the Irvings he had found them whilst out on his travels – but is this a naturalistic, physical explanation for some kind of teleportation? Or, conversely, might we posit the idea that in other poltergeist cases, apports materialize do so because an entity (invisible or otherwise unseen) has physically brought them into the house? 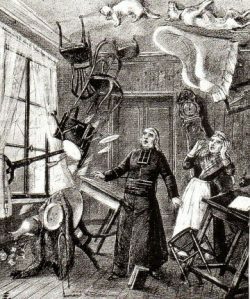 As a poltergeist, Gef was unusual – but not unique – in that he was visible to the Irvings. A more familiar characteristic in the list – “raps, etc” – appear in 48% of cases. Here we have a definite match with the Gef case, whose bangs, knocks and raps on the matchboarding were a constant during his appearances at Doarlish Cashen, a period of approximately 8 years. Whilst it is more usual for poltergeist episodes to be shorter in duration – 56% last less than a year, those lasting longer than a year are not unheard of, at 24%. In 36% of Cornell and Gauld’s cases, large objects were found to have been moved. They state, as an example, chairs. The only possible instance of this for Gef would be his pushing the chair back and forth up on his ‘sanctum.’ Other than that, he was not known to move furniture. After “raps, etc,” at 48%, the next highest figure is “imitative and miscellaneous noises” at 43%, whereas “voices, groans, whistles etc” come in at 26%. Thinking back to Gef’s initial attempts to speak, which involved repetition of words and phrases given him by Voirrey or Irving, the imitative element may be relevant here. Gef was perhaps an atypical poltergeist in that he progressed from the merely imitative to original speech. Aside from speaking, he was also known to scream and in particular to laugh for up to 20 minutes at a time – but it is doubtful whether this could be considered as imitative. Another relatively common feature from Cornell and Gauld’s data are “phantasms (human)”, at 26%. We are familiar with accounts of haunting of place having as their more striking element, the appearance of human forms who may or may not be identified with the entity or entities thought to be haunting the building or space. In the Gef case, no such apparitions were ever seen. One might regard the white cat which appeared to one of the three visiting Peel fishermen as an animal apparition; likewise, the oversized Manx cat stalked by James Irving with his gun – in the data, such apparitions are far less frequent: “Small animals seen, heard, felt” (6%). And, of course, one could well include sightings of Gef himself in this category. If one considers an entity of some sort to have been responsible for the events, it is natural to assume that entity to have been Gef, the talking weasel or mongoose – although these (like the white or Manx cats) may merely have been the form adopted by the entity. One could continue examining Cornell and Gauld’s list of specific characteristics, and it would become clear that far more features identified by them as common to poltergeist cases were absent from Doarlish Cashen than were present. Although it should be emphasized that a ‘classic’ poltergeist case will not feature all these elements, the absence of so many of the most common ones might lead us to conclude that Gef was not a poltergeist. Alternatively, we could conclude that he was, albeit a somewhat atypical one. With regard to the frequency, or otherwise, of a poltergeist talking, and being able to maintain conversations with human interlocutors, Cornell and Gauld’s data is unclear on this point. Although voices are mentioned in their list of characteristic phenomena, in “voices, groans, whistles, etc,” such voices may not necessarily be part of a two-way dialogue, or even coherent sentences. And similarly, whilst another cited feature is “communication through phenomena,” such communication may have been through means other than speech. So, in summation, we do not have a percentage score for talking poltergeists. However, what can be said, based on historical accounts, is that they are not as rare as may be presumed.